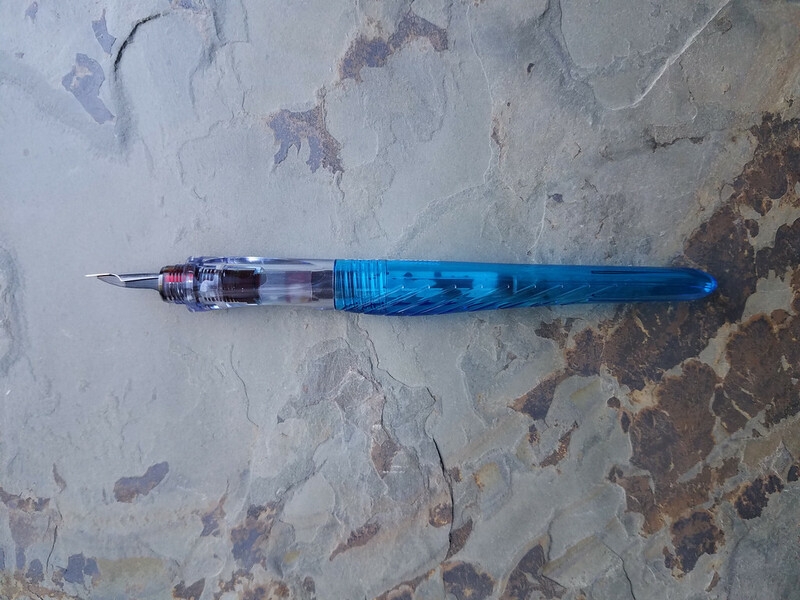 Any way you splash it, the Pilot Plumix is an ugly pen. So it’s a good thing I don’t judge pens by their blubber, because I’d be missing out on one of the cheapest ways to try a cursive italic nib. The barrel is long, slim, and asymmetrical in shape, much to the annoyance of every pen blogger who’s tried to photograph this critter. This is a long pen, especially when capped or unposted. When posted, it’s the second longest pen in my collection after the Lamy Vista/Safari. Like its cousin the Pilot Kaküno, the Plumix has a triangular-shaped section. 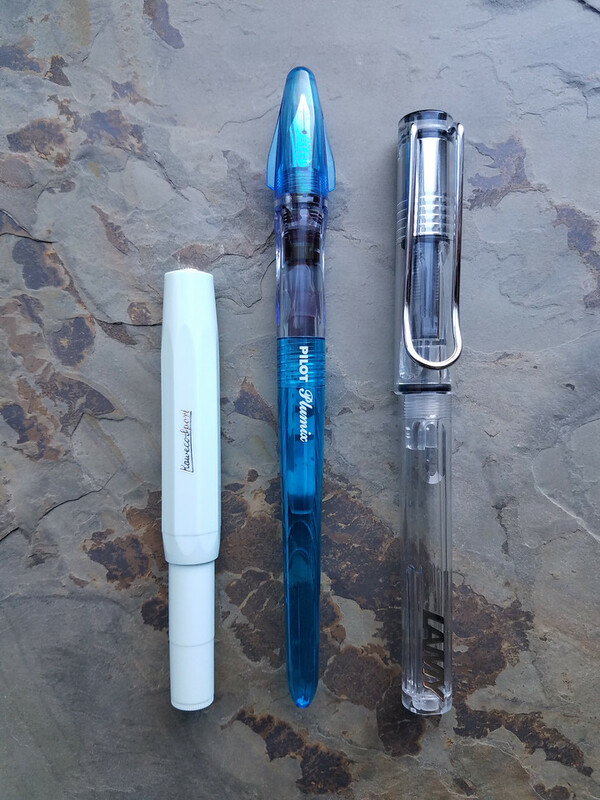 However, its edges are more rounded than the Kaküno’s section, and I found the Plumix to be the more comfortable pen after writing several pages with my standard tripod grip. In terms of width, the Plumix’s section is comparable to the Kaküno’s, which in turn is slightly wider than the Pilot Metropolitan’s. 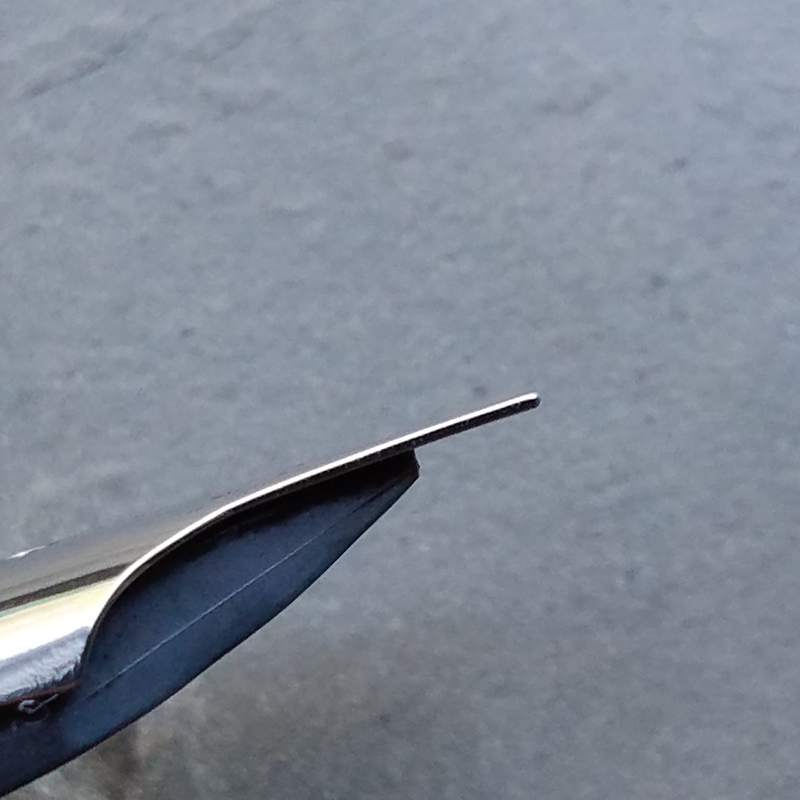 Due to the presence of cap threads, the section on the Plumix is pushed further back from the point of the nib, so those of you who like to grip your pens as close to the paper as possible might find it disconcerting. The Plumix definitely forced my grip a little higher than I’m used to, but not enough to be a dealbreaker. The pen is very lightweight, but balanced when unposted. As always, I must mention that I have smaller hands, so your experience may differ. Like most modern Pilots, ink is stored in a Pilot-proprietary converter or cartridge. The barrel is watertight so an eyedropper conversion is possible, though I haven’t personally tried it. 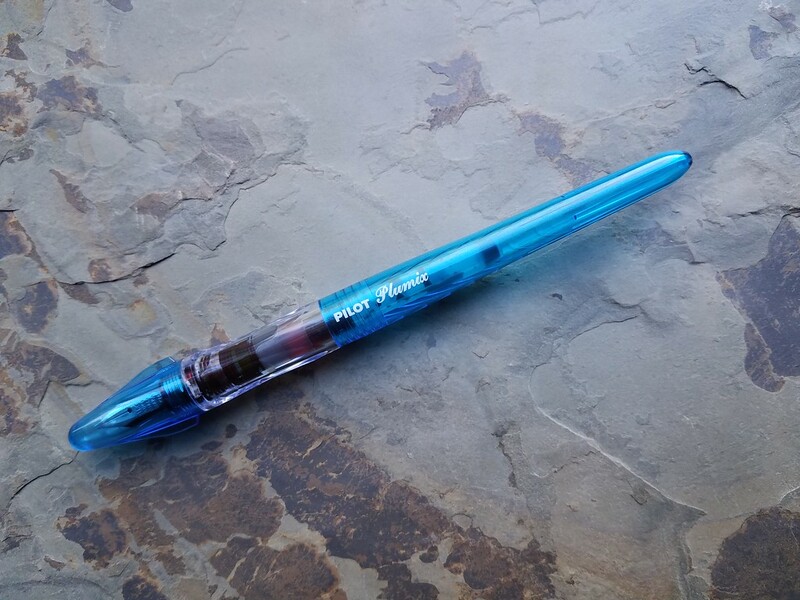 The Plumix comes with a cartridge of Pilot Blue ink to get you started. 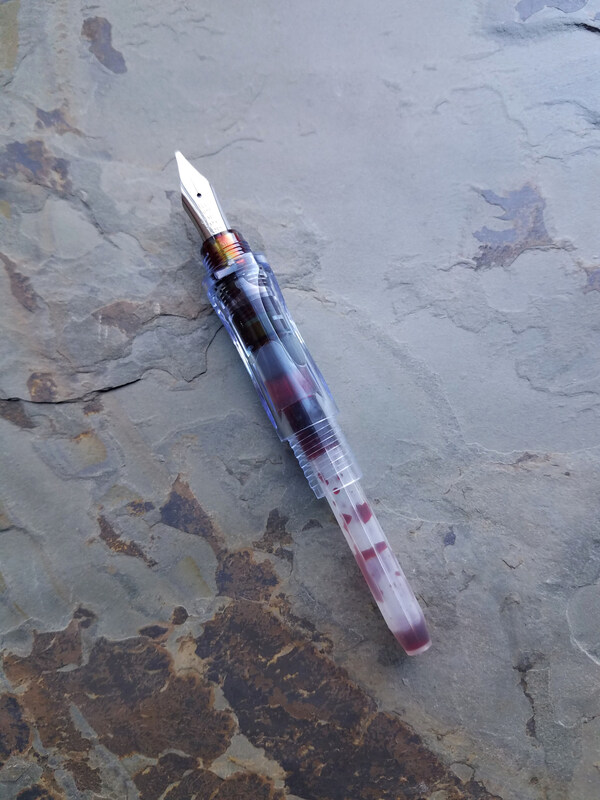 I used up the cartridge that came with my pen long ago, so in this post, you’ll see a cartridge I filled with Diamine Ancient Copper. The Plumix is available with a variety of nibs, but the star of the show is the “1.0mm medium stub”, which is closer to a cursive italic in practice. It’s a Pilot steel nib, and this one is up to Pilot’s usual excellence, as it’s a smooth writer with no flex. However, all the cursive italic (CI) caveats apply: your experience will largely depend on your grip and writing angle. If you don’t hold a CI pen just so, you’ll find the nib to be scratchy and it’ll catch on the paper. 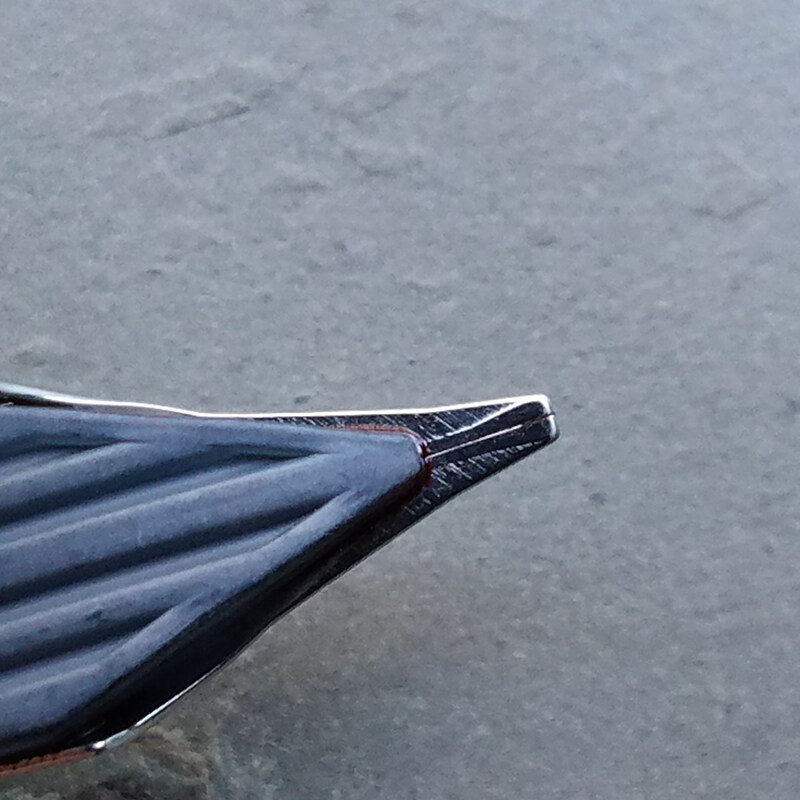 But once you find that sweet spot, this nib really sings. I forgot to take a picture of a good writing sample before I went overseas (doh!) but here’s a partial one. 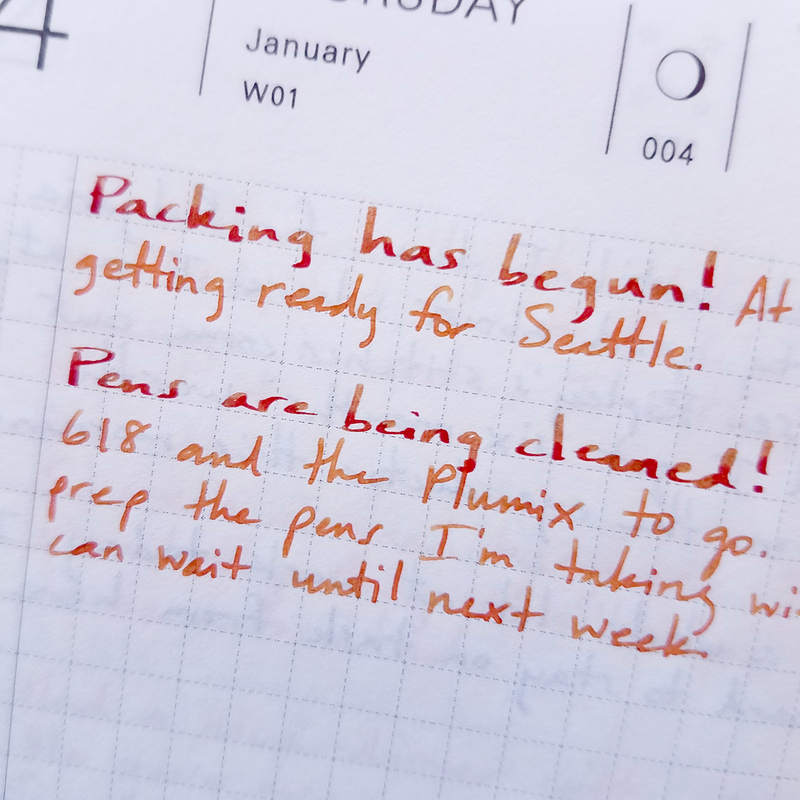 The words “Packing has begun!” and “Pens are being cleaned!” were written with the Plumix. You can see a clear difference between the Plumix’s CI nib and a typical F nib. I’ve seen the Plumix on sale for as little as $7.25, which makes it the most inexpensive entry point to cursive italic nibs I know of. 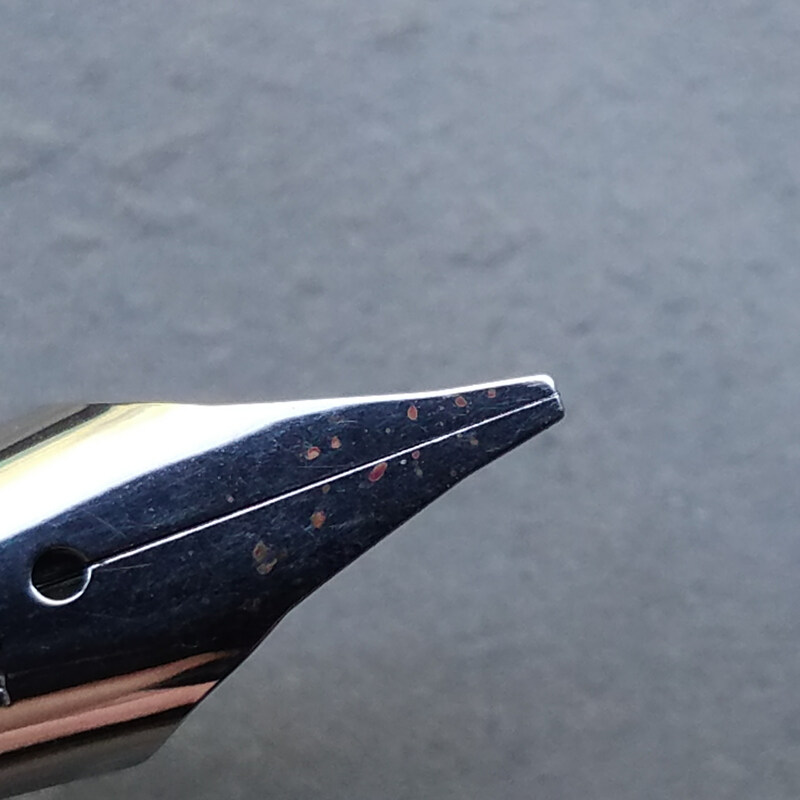 Even better, the Plumix shares the same nib as the Pilot Metropolitan, Kaküno, Prera, and Penmanship, so if you have one of those pens you can do some nib swapping and try a CI nib on the pen you like. The Pilot Plumix isn’t the cutest critter in the inky seas, but it’s a great way to get a nice CI nib on the cheap, and for that it gets my stamp of approval. 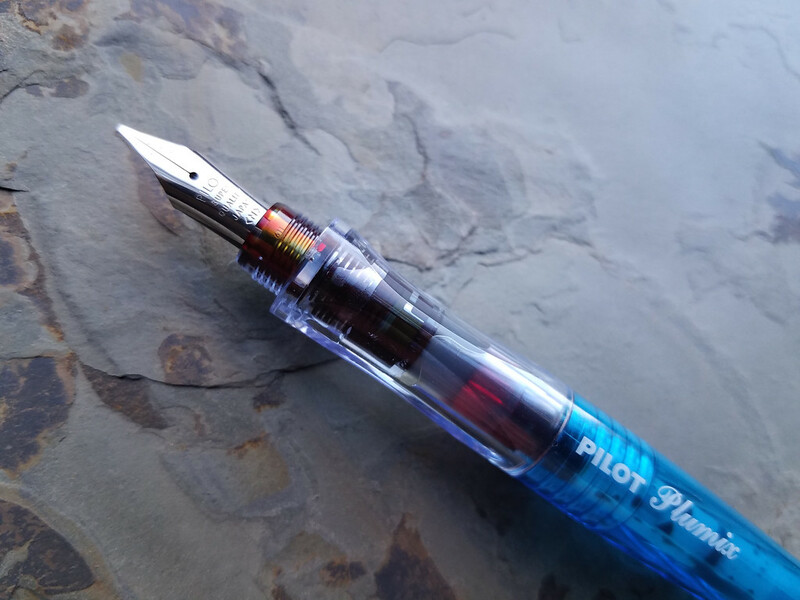 This Pilot Plumix was paid for with my own funds. My opinions on this blog are always my own. Please see my review ethics statement for more details. Thanks for your review. I like my Plumix, even though it is ugly. 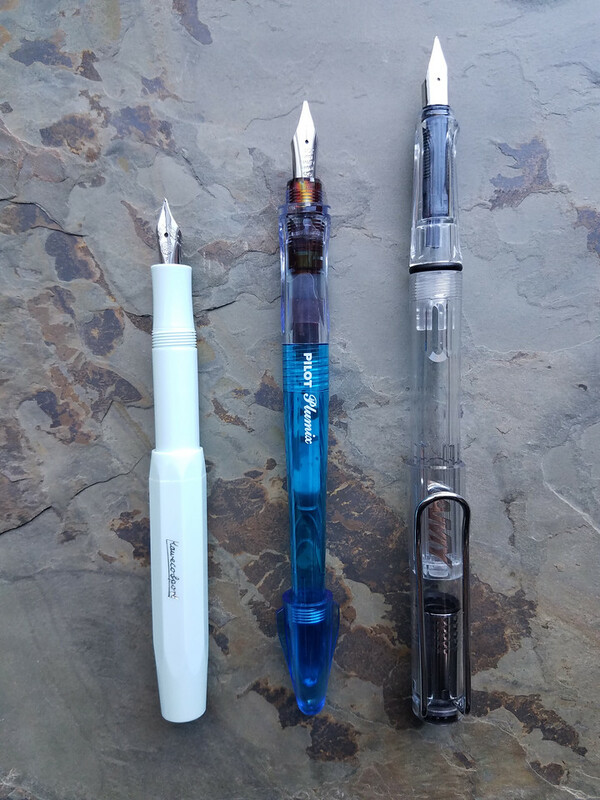 It’s fun to write with. Thanks for this! I’ve been thinking about getting this one but avoided it because of how…unsightly it looked. Despite me really liking my penmanship, which is just as simple and plain looking, but at least symmetrical. Do you know if the nib is swapable into the penmanship, if so, I might consider getting one since it really is so affordable. Yep, it is. The nibs on the Plumix, the Penmanship, the Kaküno and the Prera are all interchangeable. Some of these pens do come (sometimes or somewhere, depends on where you buy them maybe?) with a feed fitted to the Pilot cartridge system, while some also come with a “thorn” for standard international cartridges. I have Plumixes, Preras and Kaküno fitting Pilot’s own system als well as Kakünos and a Penmanship for standard international cartridges (and converters, respectively). So you may have to pay attention to swap nibs but let the feeds stay with their pens, which is no problem since they all fit perfectly, at least mine do, thanks to Pilot’s quality. Great review! I love my ugly Plumixes although I essentially bought these just for the calligraphy italic nibs, the greatest fr me being the very narrow 0.32 EF. I have signed up for the blog, and enjoy every issue. Thanks for the info, Julie! 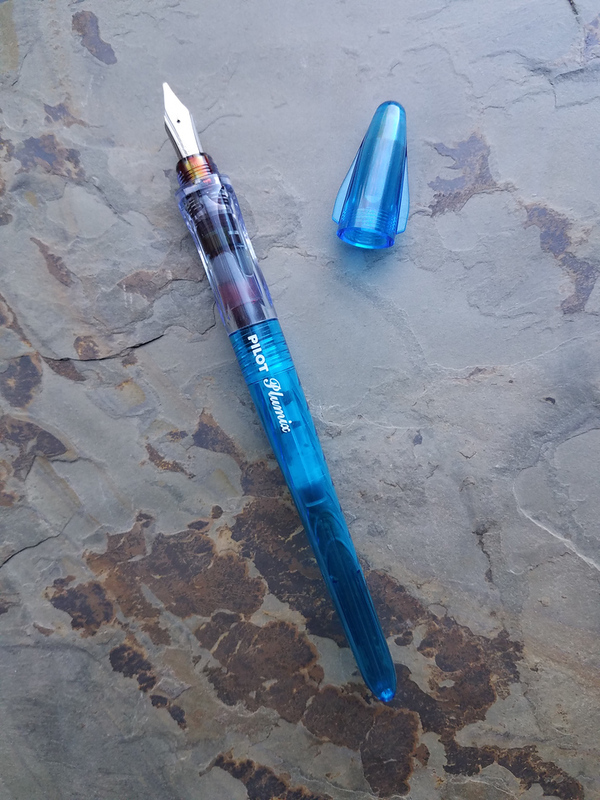 I updated the post to add the Penmanship to the list of swappable pens. Can you tell me more about the calligraphy italic nibs? I don’t think I’ve ever seen these for sale. Thanks for this! I do like the sound of that nib… but then my eyes travel down the section and along the barrel, and I’m thinking that maybe Flipper deserves to stay in the ocean. I’m actually thinking about getting a second Pilot Metro just so I can put this Plumix nib into it instead. It’s not just the look of the Plumix that irks me — it’s the awkward proportions. It doesn’t fit well in my Nock Lookout pen case, for example. I bought one a couple of years ago purely to try that nib, already knowing that for 10 bucks I could slip it into one of my Pilot Metros, which is what I did after 0.1 seconds of trying the Plumix. That nib has happily resided in my Metro ever since! And truth be told, I much prefer this 1.1 stub nib (or cursive italic nib more than the fancy schmancy spendier one I got custom done from Spain). DO ITTTTTT!!! 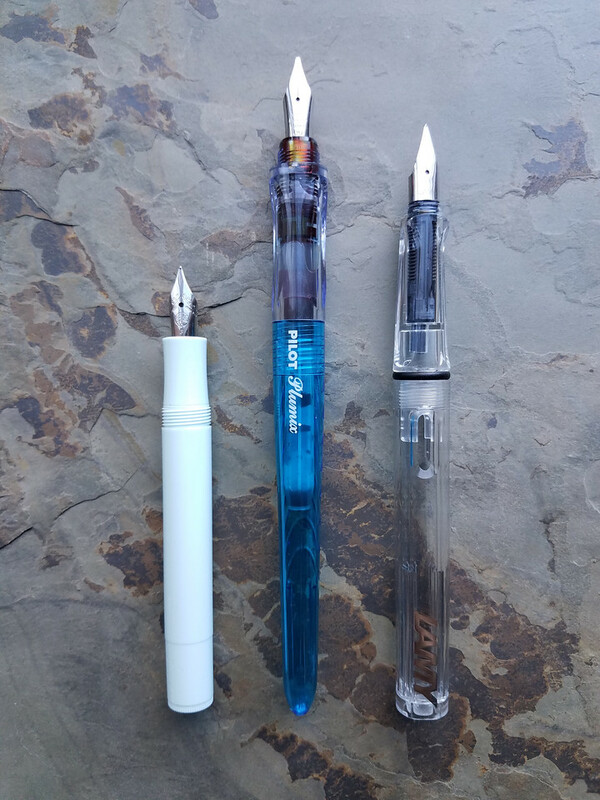 Get a second Metro and give that beautiful nib a good home! I’m still bummed that fpnibs nib isn’t working for you. We’ll have to take a look at it the next time I’m in town.